Out with the old, time for new shoes! Okay, I could probably blame this on a severe case of nesting, but lately I'm going through every room in my house and organizing things. This all began because I couldn't get the hall closet door to shut so I pulled out all the shoes and decided I could get rid of 3 pairs. I then decided to take this shoe energy up to my room and found 4 more pair I could live with out. That's 7 pairs ladies! And let me tell you, it feels good! Some were old, some were cheep, and one had a broken strap. I could find a reason to keep each pair, but in the end my golden rule is if I haven't worn it in over a year, odds are I'm not going to wear it again. And now I'm just taking up new shoe space! I now kind of NEED to buy shoes right?! 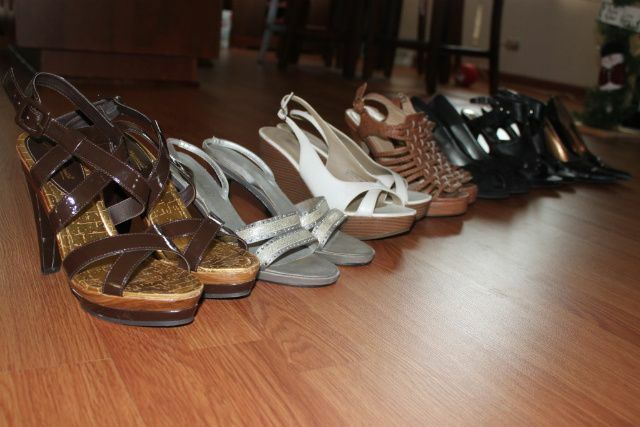 I mean, there are open spaces in my closets so I might as well fill them with great shoes! My hubby was so proud, he practically begged me to start shopping. Okay, maybe that's my interpretation of what happened, but hey, tomato tomato! I moved about 5 months ago and downsized my shoe/clothes collection by at least half. It was so hard to part with old favorites but it feels SO GREAT to, for once, finally have organization. I still need to do some replacing though! I have been craving a pair of rain boots!! Haha I agree with every sentence of this post :) happy shopping!! Thank you so much dear!! I can't wait to begin the make up school! It feels so good to let the old things go- p.s. I could only wear flip flops by the end of my pregnancy! I give myself a push to clear my closets by donating those things and thinking of someone else actually using what I've just been hibernating. Wow!!! I am super impressed that you cleaned out your closets!! Good for you!! My closets are awful! I keep telling myself I will get to it!! WAIT!!! Wait until this baby is born. Seriously, my feet were an 8 before baby #1. An 8 1/2 after baby #2. And I'm now a size 9. Sigh... The feet definitely grow with kids. Put them for sale on your site. I'll buy a few. Help to fund the new shoe purchases.